Before booking a consultation, please review our combined bioresonance and naturopathic appointments consultation process below. Ongoing appointments: At least one (preferably three) 1-hour weekly follow-up bioresonance consultations. Important: The above appointments should be booked in advance (ideally in adjacent weeks) by phoning our receptionists at Ilkley Healing Centre 01943 602177. Please complete the relevant a new patient form detailing your full history of presenting symptoms as well as any previous medical history, family medical history, allergies, intolerances, medications, diet and lifestyle habits. The form is detailed as we require extra information regarding scars, vaccinations and dental work, so please allow time to complete it before your consultation. Wear loose comfortable clothing (ladies: no dresses). Mobile phone, metal jewellery and watches to be removed from the body for any Bicom Bioresonance consultations. A 1.5-hour initial Bicom Bioresonance and naturopathic consultation with Jenny will your pre-assessment consultation. There is no need to fast for this consultation or any further consultations. During this consultation, Jenny will conduct very detailed testing and, combined with the body scan results and other naturopathic diagnostic tools, will then devise a therapy plan including Bicom bioresonance therapy, diet, lifestyle recommendations, supplements, herbal medicine etc to help you achieve optimal health. 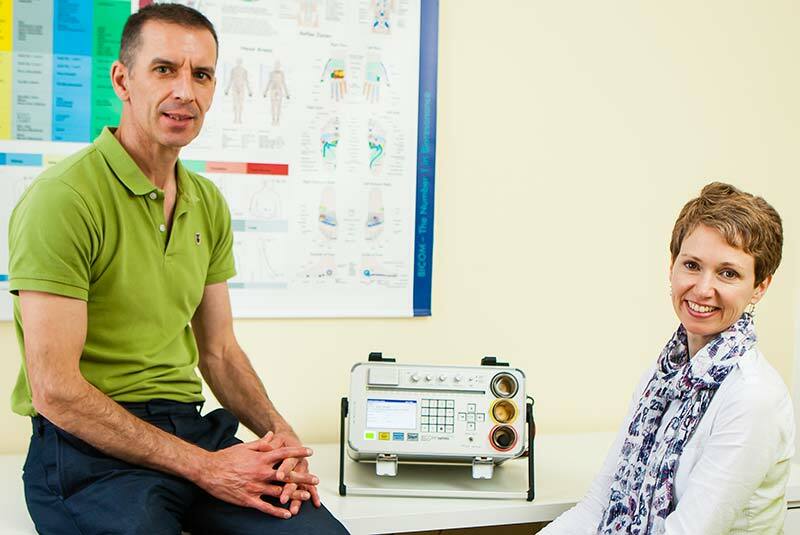 During follow-up consultations patients receive individualised therapies (including inversion of pathogens, detoxification, immune support) and further testing to determine the progress of the treatment and continuing naturopathic advice. From our experience, most patients require in excess of 3 weekly consultations, so, for this reason, we encourage you to book ahead at least one more follow-up consultation to allow continuity of treatments. What’s involved in the consultations? As with the standard Naturopathic consultation (refer below), a treatment plan including diet and lifestyle advice is established to help you reach optimal health. In addition, nutritional supplements, herbal and homeopathic medicines, flower essences and mineral therapy may be prescribed alongside bioresonance treatment. Possible recommendations for clinical diagnostic tests such as saliva hormone testing, thyroid testing, MTHFR screen and kryptopyrrole screening. A treatment plan including diet and lifestyle advice is established to help you reach optimal health. In addition, nutritional supplements, herbal and homeopathic medicines, flower essences and mineral therapy are commonly prescribed. For information regarding fees for these consultations, please refer to the fees structure page. For information regarding the Terms of Service please refer to the Terms of Service page. Jenny offers mentoring and training for healthcare professionals for both Bicom bioresonance therapy and naturopathy. For more information please refer to the mentoring and training page. More people worldwide are suffering from allergies than ever before. An allergic reaction or symptoms of intolerances are the body’s way of coping. The good news is BICOM® Bioresonance can help identify, treat and neutralise allergies swiftly and effectively. What allergies can be identified, treated or neutralised? BRT treatment – for each allergen. Please note, only one allergen is treated per session. BICOM® Bioresonance Therapy is a non-invasive, effective and gentle therapy for the diagnosis as well as treatment and healing of the symptoms of illness without damaging side effects. It assists the body to reduce its toxin or stress load and helps to restore ‘self-regulation’, the body’s ability to heal itself. All living cells, organs and substances emit unique frequency patterns as weak electromagnetic waves similar to frequency waves used in orthodox medical diagnostic (ECG, EEG scans, ultrasounds etc). By using electromagnetic frequencies to diagnose and treat, it is possible to stimulate the patient’s own immune defences and the body’s own ability to self heal. Naturopathy is a holistic approach to healthcare that emphasizes optimal wellness, disease prevention, patient education and the use of natural medicine and techniques to support the body’s inherent healing process. As a Naturopath I consider every aspect of your health and seek to find the underlying cause of your problems, rather than just treating the symptoms. I use a combination of diet and lifestyle strategies, nutritional supplements, herbal medicine, homoeopathic remedies, mineral therapy and flower essences to assist is restoring health and wellbeing. The Quantum Resonance Magnetic Analyser (QRMA) is a bioenergetic and biochemical analysis system, which provides a representation of the health/illness state of patients. The QRMA combines live computer science, biophysics and electrical engineering and is based on the theory of the scalar-physics findings. The Nonlinear Body Scan is a non-invasive complementary medical analysis system that scans and analyses and depicts the current energetic state of organs, tissues, and cells. The technology is based on 20 years of research conducted by a number of Russian teams who recorded frequencies emitted by particular organs. They recorded what the normal frequency response would be for any particular age of either male or female subjects of each of the organs. This medical technology classifies the degree of existing stresses/dysfunction and indicates potential causes of the stress or dysfunction. The actual scan is quick, non-invasive and painless. It involves sitting in a comfortable chair with headphones on your head. The patient is able to watch the results live on a wall mounted TV. Optimal nutrition is a vital part of health and wellbeing. Food provides us with the necessary nutrients needed for the body to function. As part of your consultation, I carefully analyse your nutritional intake to identify possible deficiencies or excesses that may be contributing to your symptoms or hindering your ability to achieve optimal health. I also use iridology, tongue and nail diagnosis to identify nutritional deficiencies. Individual dietary needs vary greatly. I tailor your eating plan to suit your circumstances, intolerances and desired health outcome whether you are recovering from illness or wanting to lose excess weight (for example). Western herbal medicine utilises the healing powers of plants to assist in the prevention and treatment of various health issues. Many different parts of a plant, such as flowers, roots, fruits, leaves, and bark, can be used to create medicines to help prevent or treat various illnesses. Western Herbal Medicine remedies have been found to support many different systems of the body, including the digestive, respiratory, circulatory, immune, endocrine, and nervous system. Flower Essences work on the principle that vibrational energies from different flowers may assist in realigning dysfunctional emotional patterns, and in doing so increase physical and mental vitality, in turn resolving physical disease states. Toxins not only come from our external environment; they can also be generated internally from pathogens and oxidative stress. Toxins can contribute to poor health and disease. A natural detoxification program can be one of the most effective strategies for rapidly improving your health. It is also excellent for hormone imbalances. I use a combination of BICOM® Bioresonance Therapy, medical clays, diet and nutritional supplements to help clear your body of accumulated toxins. Are you looking for a natural weight loss program that is successful and long-lasting? Have you tried many diets without lasting fat loss results? There is no quick fix to losing weight even though drugs and surgery are often offered. It is easy to try one diet after another but this will never be a long-term solution. The only way to lose weight safely and to keep it off is to treat and support the reason for the weight gain in the first place – whether it be an underactive thyroid gland, food intolerance, blood sugar imbalance, hormone imbalance or poor food choices and lifestyle habits. I tailor a weight loss program suitable for your needs that is realistic to follow for you to achieve long lasting weight loss benefits. My main area of expertise is hormone health and women’s health including fertility and weight loss (LINK) and with over 20 years experience in clinical practise, I can help you to reach and maintain optimum hormone health and wellbeing. Whether you are dealing with infertility, thyroid gland problems, PMS, Polycystic Ovarian Syndrome (PCOS), endometriosis, fibroids, menopause, problem skin (such as acne) or even stubborn weight loss, there is often a natural solution. I use a combination of diet, nutrition, herbal medicine, homoeopathy and bioresonance to achieve hormone balance. In addition, I am able to manufacture tailored bio-identical hormones (BIHT) for my patients using my bioresonance machine.